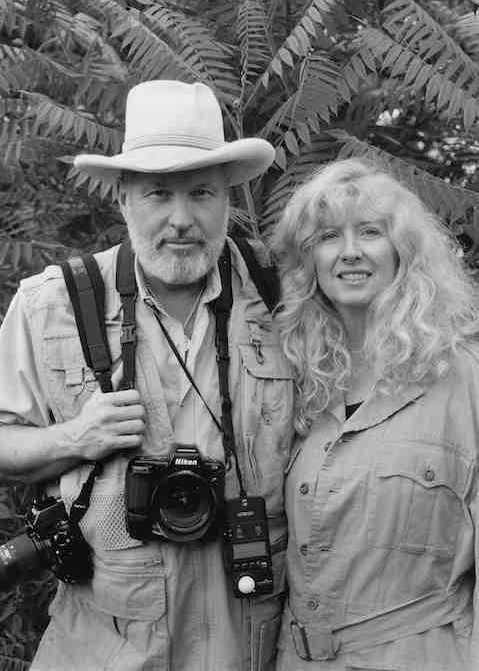 Writer Victoria Thomas and photographer David Björkman came together when they were sent on assignment into the Darién Jungle of Panama to document the Explorers Club Chagres River Expedition (Flag 172), which undertook an archaeological survey of a Chocó Indian settlement and collect artifacts for the Smithsonian Institution. They lived with Chocó Chief Antonio Zarco, who taught the original U.S. Apollo astronauts jungle survival in case their capsule landed in the tropics on reentry, and documented the traditional Chocó lifestyle that was quickly disappearing as contemporary culture encroached further into the jungle. They also learned jungle survival. The Zarco women honored Victoria by painting tribal symbols on her face and upper body with black berry juice, neglecting to mention that it would last for weeks. On the flight back, no one wanted to sit closer to her than a three-chair radius in the airports. On a second expedition the following year, Chief Zarco joined David and Victoria in marriage, while this time Victoria had the women paint only her upper body. (The marriage vows were later made official, at an elevation of 12,000 feet, by the late Honorable Judge David Torke on the summit of the Gore Overlook in Rocky Mountain National Park). For the next decade, David's and Victoria's work took them to the jungles of Central America, and to the Yucatán Peninsula of Mexico, where they began a multi-year project documenting the Maya and their pyramids. In 1998, they founded Zone913, Inc., an independent media and publishing company, to publish photographs and books. They continue to explore and publish Artwork and books on topics that intrigue them.